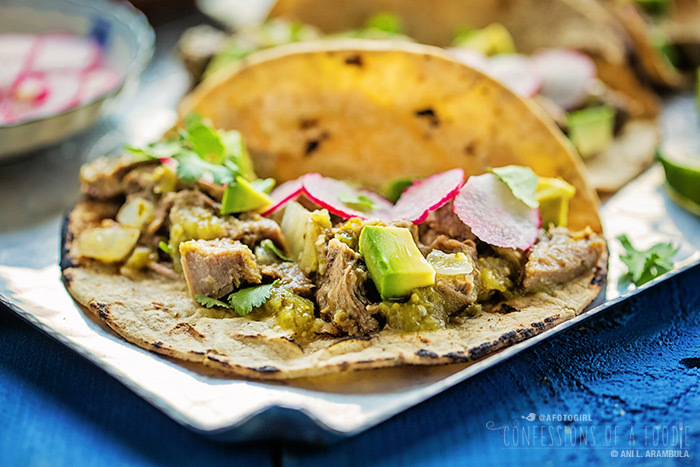 Last of a 3-part series on cooking a 5-pound tongue to use in three different Mexican dishes. 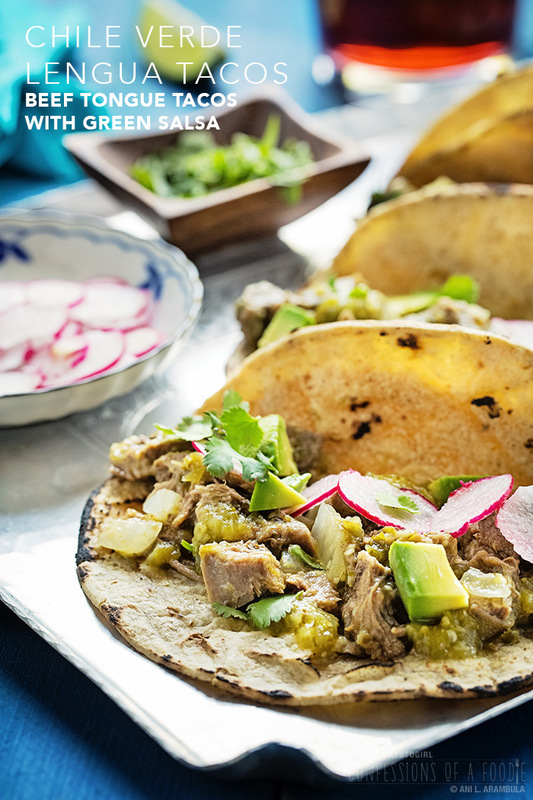 Today, it's chile verde lengua tacos. 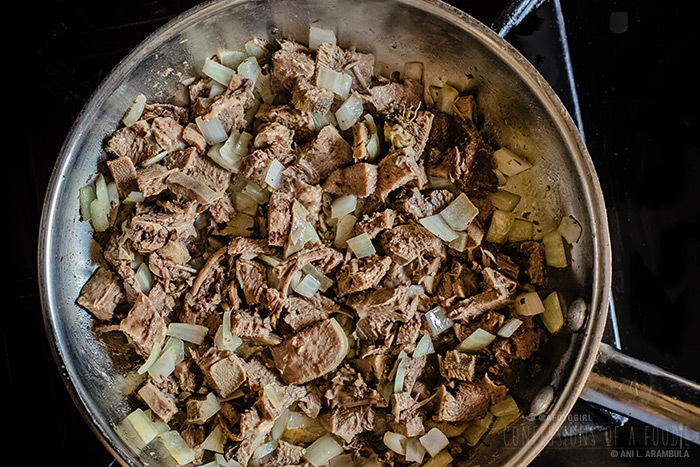 Part three of a three-part series on how to cook a 5-pound beef tongue for three different Mexican dishes. 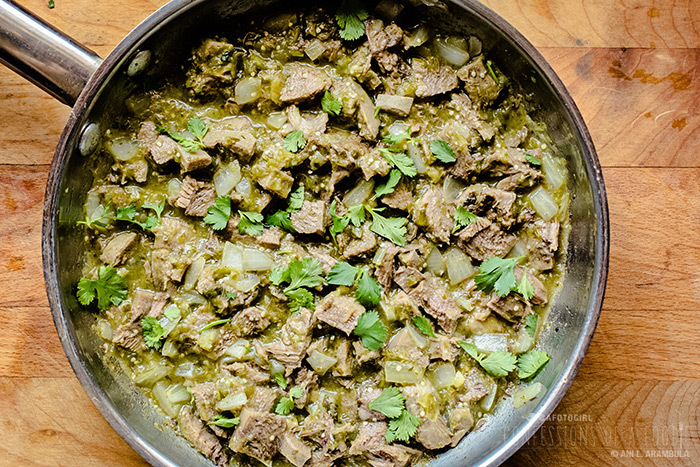 Today, it's chile verde style! Chile verde is not something I learned to appreciate until well into my 20s. Dad made it occasionally with its most frequent appearance at my grandmother's table for special dinners during the holidays or my grandfather's birthday. And even then, it was only ever served as a condiment on the side as an alternative to my grandmother's salsa roja. I make it now probably more often than I make red salsa or chile colorado and I absolutely love cooking with it. Today's version is a simple, very traditional recipe wherein the vegetables are boiled, blended and then fried and cooked until thickened. At that point, it can be used to braise whatever protein or veggies you want to cook in it or it can be cooled completely, jarred and used as a condiment later. 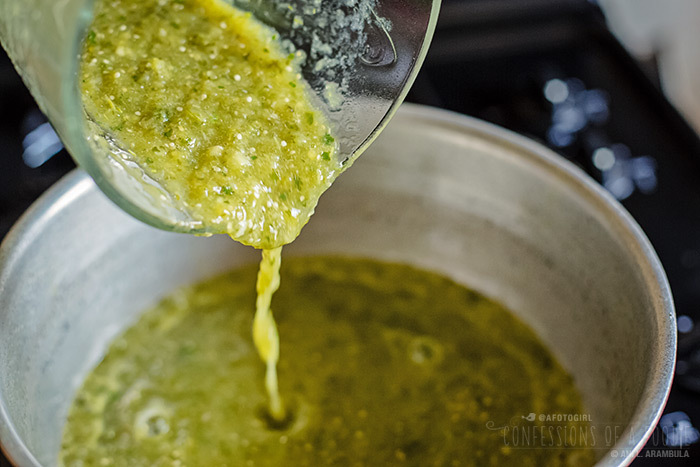 Speaking of condiments, in case you missed it, I did post a roasted tomatillo salsa recipe a few years ago. Both are good but definitely different even though they have virtually the same ingredients. 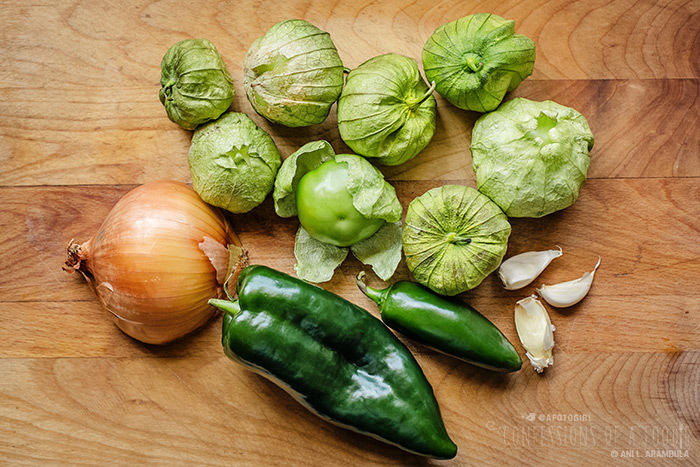 Speaking of ingredients, this is what you're going to need: 8 tomatillos (about 1 pound), one poblano, one jalapeño, 3 cloves of garlic, and half a Spanish onion (often called brown, although technically they're considered yellow). Peel the garlic and onion then remove the husks from the tomatillos. You need to run them under cold water, rubbing to remove the sticky residue left behind by the husks. Bring a stock pot halfway filled with water to a boil. Quarter the onion and add one quarter of it to a pot along with the two of the garlic cloves, the tomatillos and peppers. Bring to a boil again, lower heat and simmer, cooking for about ten minutes or until the colors darken. 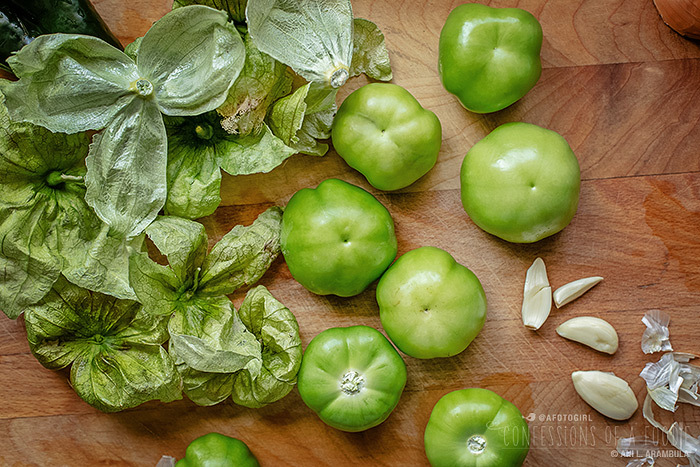 When ready, the tomatillos will change from bright green to a dull greenish yellow while the peppers will turn a dark, slightly yellowish green. Scoop out the the veggies and add to a blender along with the reserved onion and raw garlic and half a bunch of cilantro, stems and all. If you're a heat wimp like I am, cut the peppers in half first and remove the seeds before adding them to the blender. This will cut their heat by about half while retaining their peppery goodness. You'll need about a ½ cup of the cooking liquid. Then blend until just slightly chunky. Heat 1 tablespoon oil in a pot and once shimmering, carefully pour in salsa (watch out for splattering). Reduce heat and allow to simmer while you proceed with the recipe. Rough chop some onion. Heat some oil in a skillet and sauté the onion for 2 minutes, careful not to burn. Chop the remaining tongue into bite-sized pieces and add to the onions. Cook, stirring, until heated through and just starting to lightly brown. Pour in the salsa. Top with chopped cilantro. 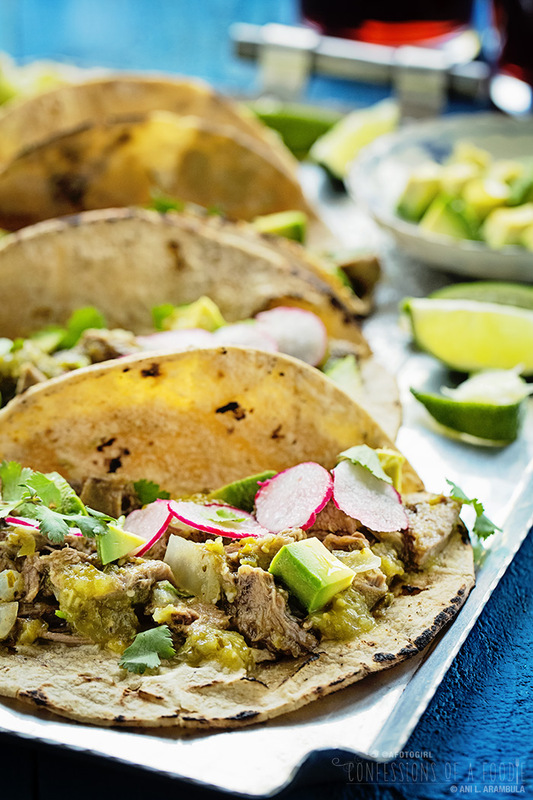 Serve over rice or my favorite, in warm corn tortillas. 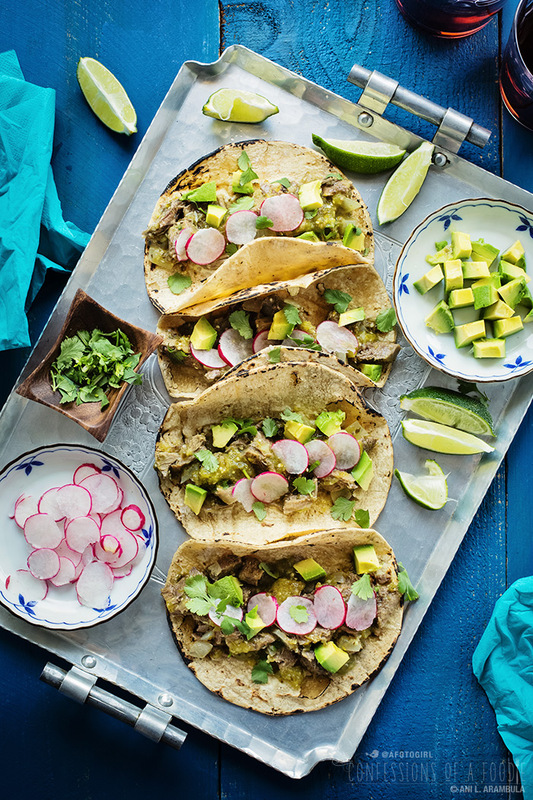 Garnish the tacos with avocado, thinly sliced radish, cilantro and juice from a small wedge of lime. Mmm. Now that I've finished the writing and editing of this series, I'm ready to go back and make some more just because it's that good! 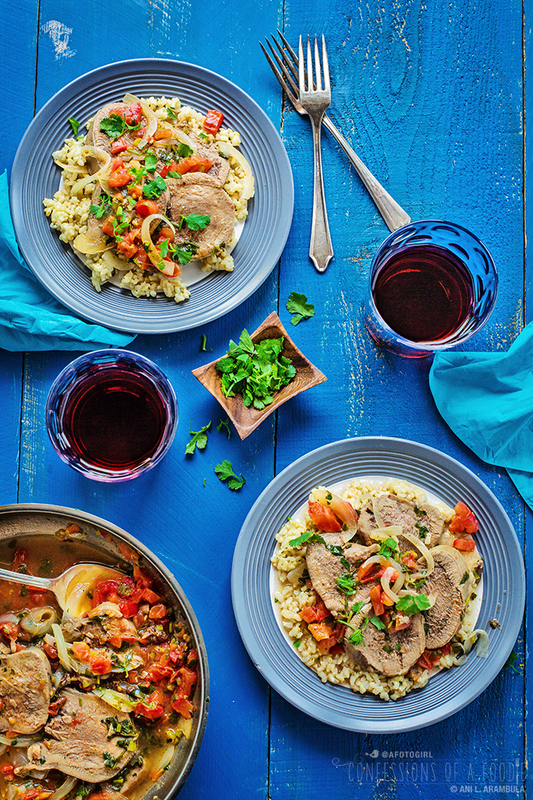 You'll be using the final third of the previously cooked 5-pound beef tongue. When boiling the tomatillos, be mindful not to overcook or the skins will burst, rendering most of the fruit unusable. This makes more salsa than needed for this particular dish. Once the leftover salsa is completely cooled, place it in airtight container and use it as a condiment throughout the week. 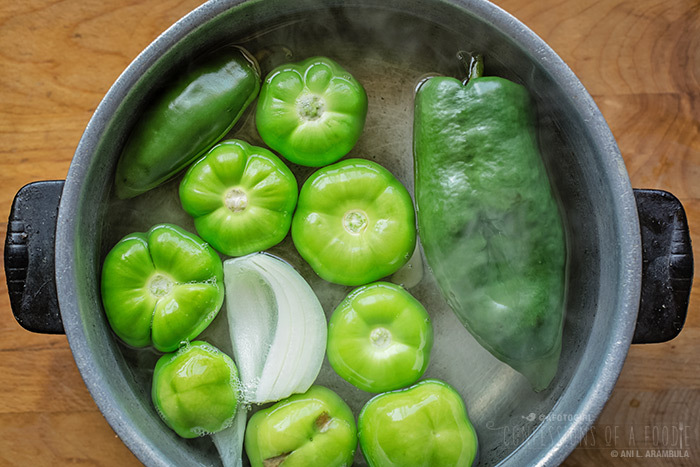 To make the salsa: Fill a soup pot with water to half full; bring to a boil. Remove the husks from the tomatillos then rinse. Add them to the boiling water along with the peppers, 2 cloves of garlic and ¼ of the peeled onion. 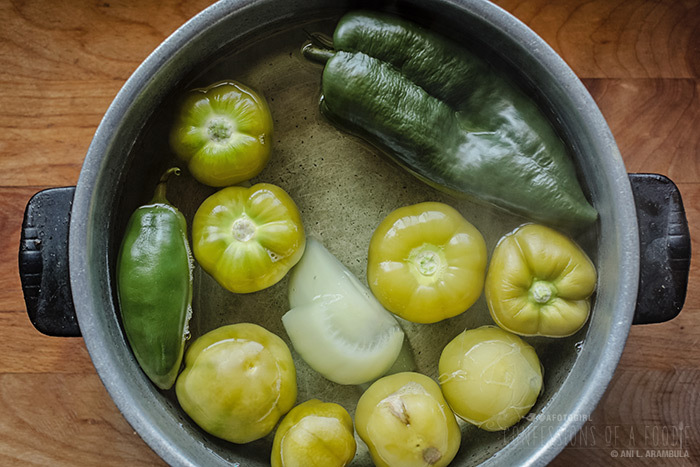 Bring to a boil again, reduce heat to a simmer then cook for about 8-10 minutes or until the tomatillos have changed from bright green to dull yellow. 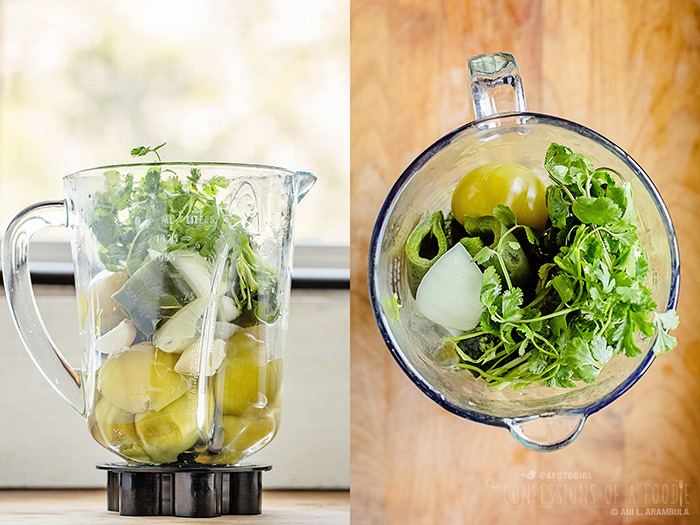 Remove the veggies to a blender, reserving ½ cup of the cooking liquid. For a less spicy sauce, first cut the peppers lengthwise and remove and discard the seeds and veins before adding them to the blender. Also add ¼ of the reserved onion, the reserved garlic and ½ bunch of cilantro. Pour in the reserved cooking liquid. 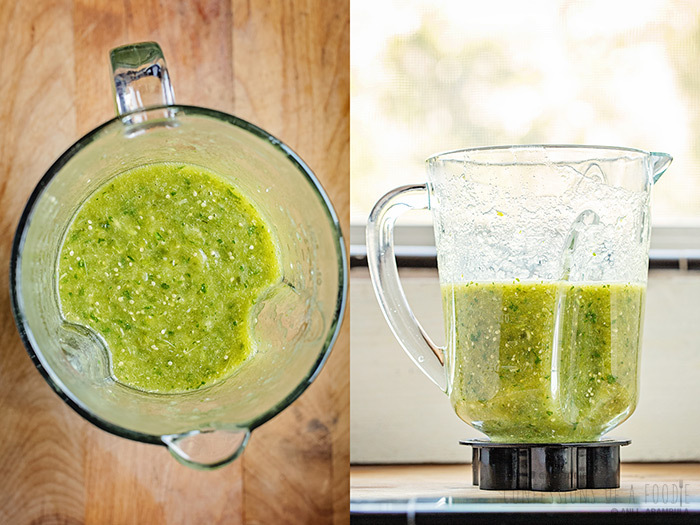 Place the lid on the blender, with the vent tab open, place a kitchen towel over the vent and blend just until the cilantro is chopped and incorporated and the tomatillos are still a little chunky. Heat a saucepan over medium high heat. Add 1 tablespoon oil and once shimmering, carefully pour in the salsa as it will splatter. Stir, reduce heat to low and simmer while you proceed with recipe. For the lengua: Rough chop the remaining onion. Cut the tongue into bite-sized pieces. Chop ¼ of a bunch of cilantro. Heat a skillet on medium heat; add 1 tablespoon oil. 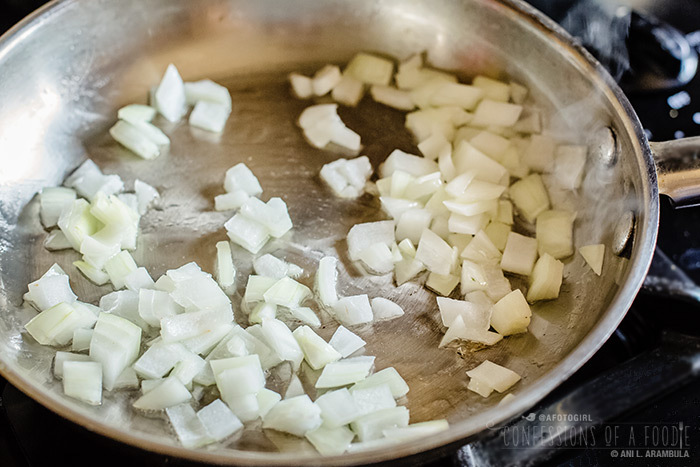 Once shimmering, sauté the onions until softened, about 2 minutes, stirring to keep from browning. Add the tongue, cooking until heated through. Reduce heat to low. Back to the salsa, turn off heat. Add a ½ teaspoon of sea salt, or to taste. Ladle about 1 cup of salsa into the meat mixture. You want enough salsa to coat the meat but not so much that it's soupy. Add up to ½ cup more if needed. Turn off heat and then stir in the chopped cilantro. Taste and adjust seasoning if needed. To serve: Divide the tongue between 8 corn tortillas. Garnish with avocado, radish, cilantro and some freshly squeezed lime juice. 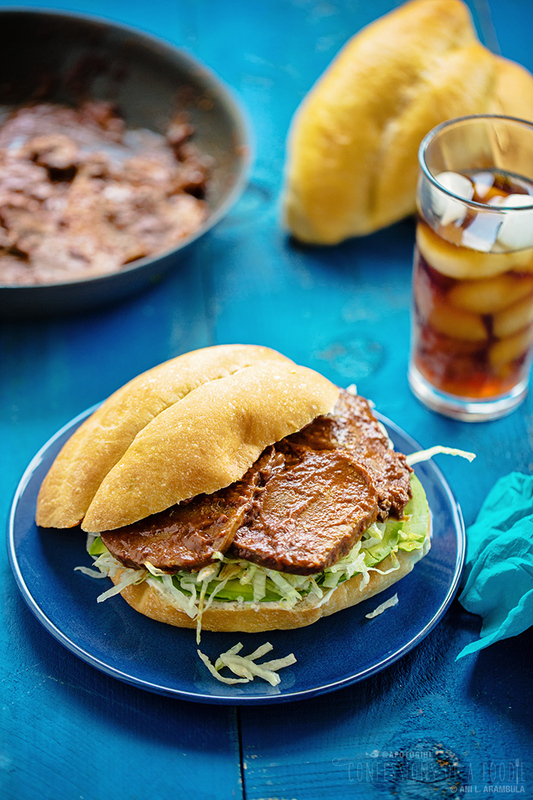 This is the final in a 3 part series on cooking beef tongue and using it for three Mexican dishes. To learn how to cook the tongue, go here. Part two is Lengua a la Mexicana, a dish that incorporates all the flavors of pico de gallo served over rice. That recipe is here. 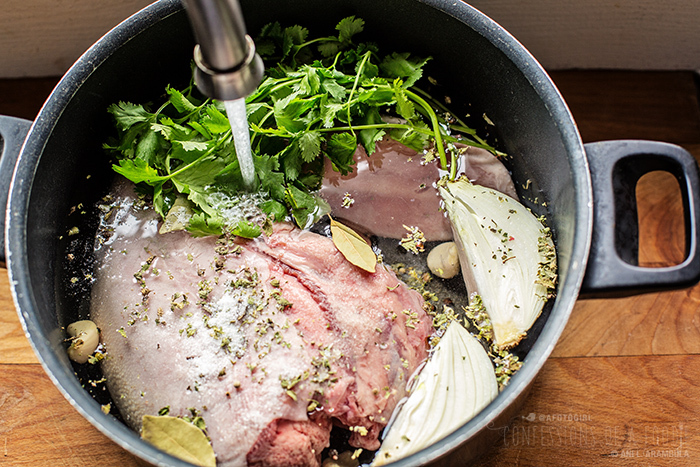 I hope you enjoyed the little peek into some of my family's favorite ways to prepare cow tongue. 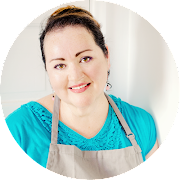 I loved sharing these recipes with you. I know it's a little intimidating to try a cut of meat you might have eaten out at a restaurant but not cooked at home yourself. I do hope you give these a whirl. If you do, share a picture on Instagram and tag me (@afotogirl) so I can see your creations! Until next time, friends ... ¡Buen Provecho!